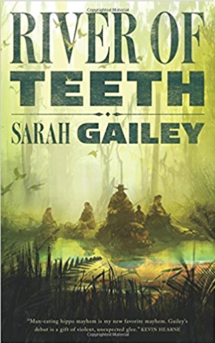 Sarah Gailey’s debut novella River of Teeth comes to us upon the back of this delightfully madcap concept, and we should all be very thankful that it did. In this alternate history revenge story, we follow a ragtag team of mercenaries that would have felt equally at home wandering the plains of the Old West. Instead we find them riding through an American bayou teeming with feral hippos. That their own mounts are hippos makes them none the safer. There is more to love about this story than its premise. Gailey is a well-established short story author and columnist, and her first foray into longer form work has been highly anticipated. It does not disappoint. Her characters live and breathe on the page, and I would be hard pressed to pick a favorite. My only complaint is that I did not get more time with them. The story moves along at a rollicking pace, much like its patron animal charging to attack, and by the time I turned the last page, I was ready for more. We are all fortunate then, as we do not have long to wait. Her follow-up novella, Taste of Marrow comes out this September, exploring the aftermath of the events in the first book. I, for one, will be preordering it.